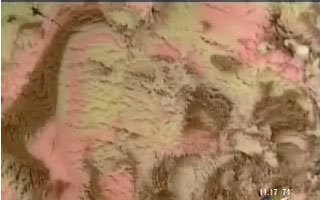 First the Virgin Mary on a Grilled Cheese sandwich for sale on Ebay and now its the image of Jesus in a tub of Spumoni ice cream. A local chocolate shop, Hatch Family Chocolates, in Salt Lake City apparently has a tub of Spumoni ice cream and the swirls of the flavors create an image that looks like Jesus. Check it out...does this look like Jesus to you?! I think that's going to have to take a lot of imagination to get a person, let along the resemblance of Jesus, out of that. I just see ice cream. How silly of me! Looks more like Dracula to me! Shouldn't a store in Salt Lake City have a tub of ice cream with Donny Osmond's face in it?